Can CPGs Achieve the Perfect Shelf with Image Recognition Apps? Despite a burgeoning e-commerce marketplace, most FMCG brands still rely on brick-and-mortar retail locations to sell their products. Here’s the problem: by the end of last year, brands had 1,000+ fewer stores to sell to and there were 9,000 more CPG items vying for shrinking shelf space. If you’re lucky enough to be on a store shelf, analyzing shelf conditions to improve the performance of your brand (and hold onto your coveted shelf space) have never been more important. The opportunities being generated from image recognition apps to achieve and maintain the “perfect shelf” are gaining traction among FMCG and CPG manufacturers. The strategy of arming field reps with a smartphone camera to capture data regarding share of shelf, out-of-stocks, planogram compliance, and expired price tags – all in a couple of minutes – is a major competitive advantage. While gathering field intelligence at the store level has become quicker and easier over the past decade, CPGs can benefit from accelerating the speed of information. Snapping a series of pictures can complete multiple in-store tasks with a single action. 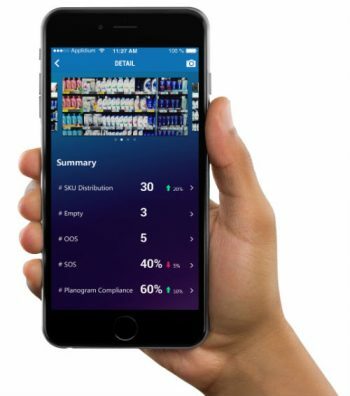 The swift output of data digitizes store metrics against sales performance and allows the field rep to address shelf issues with the retailer before leaving the store. To continue reading about image recognition apps, click here.